If everyone in the community spayed and neutered their pets we would see a decrease in the number of animals coming into the shelter each year. If you or someone you know needs information on low cost spay and neuter options please give us a call and we will be happy to talk to you about those options. Adoption fee for dogs and cats is $50 which includes spay/neuter and rabies vaccination. Payment is by cash or check - we cannot accept card payments at this time. For animals that have not been spayed or neutered: adoptions are open to residents of Tazewell, Buchanan, Russell, Bland and Smyth County. If an animal is already spayed or neutered then it is available to be adopted by anyone (even out of state residents). Phone to check that the pet is available and what paperwork is required from you. If your animal is picked up by Animal Control and it is housed at the Tazewell County Animal Shelter, there is a $5 per day reclaim fee. The longer you take to reclaim your dog/cat the more you have to pay. 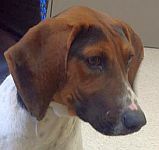 Adoption fee for a dog is $50 which includes spay/neuter and rabies vaccination. Payment is by cash or check - we cannot accept card payments at this time. For animals that have not been spayed or neutered: adoptions are open to residents of Tazewell, Buchanan, Russell, Bland and Smyth County. If an animal is already spayed or neutered then it is available to be adopted by anyone (even out of state residents). Phone to check that the dog is available and what paperwork is required (valid ID) from you. Our dogs and cats are spayed/neutered at Crab Orchard Veterinary Services, 1402 Pisgah Road, Tazewell, VA 24651. Phone: 276-988-8080.